Payment by invoice, PayPal, credit card etc. sedruck.de is your online copy shop with fair prices and fast shipping. 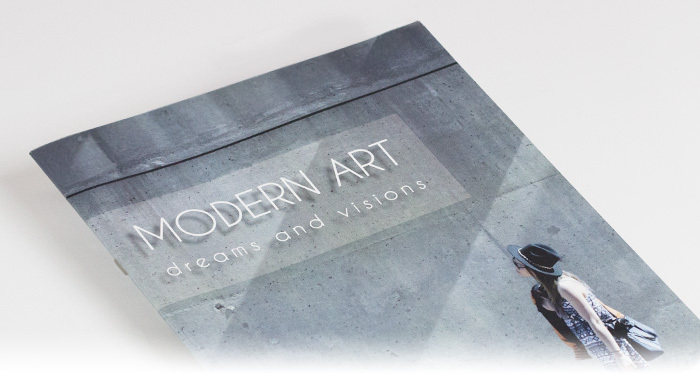 Regardless of whether you print your thesis, bind a company brochure or create a poster: We offer numerous opportunities for high-quality printing of all your projects. We give you advice and we help you to find the right option among our numerous types of printing. 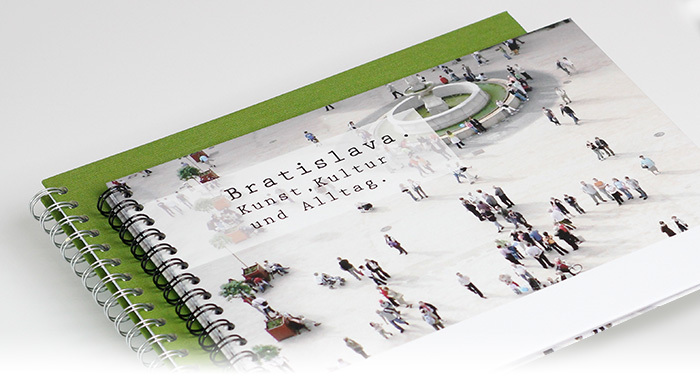 Whether corporate brochure, readers or your own book: With sedruck.de you find an optimal solution for a good price. Since 25 years we have been happy to provide top-quality printing for our customers. Every day we are binding bachelor theses, master''s theses, dissertations and more. It is always our goal to achieve the perfect look for your thesis. We use the latest technological possibilities for online designing and bookbinding. If you want us to print and bind a PDF as a book, then you have the choice between numerous high-quality looks. Also for companies, small publishers or for print jobs for special occasions (wedding book, etc.) we are your partner. Which kinds of bookbinding are available? What other services are available at our online copy shop? What to consider if you want to print with us? By navigating through the sidebar or the product tiles on our start page you will have access to the various product options available at our online printing service. The total price will be calculated for you and is immediately visible to you during configuration of your desired product. If you want to compare different versions of your product, use the 'Duplicate product' option in your shopping cart. You can always modify all the products in your shopping cart again before your finally place your order. Once you have designed your product to your liking you can upload your PDF files from your shopping cart overview. Alternatively, you can also send us your print documents via email, if you prefer. Send your print documents to in that case. Afterwards select the desired shipping option; all fees for shipping will be displayed immediately. Finally, enter your shipping and billing address by logging into your account. Once you have placed your order, you can always view the current status of your order from the orders overview page in your personal account. If you want to bind a document as a book, then you have a lot of possibilities. Depending on the type of document some binding options may be more appropriate than others. At the most basic level we distinguish between hardcover bindings and softcover bindings. While softcover bindings originally were for documents which are often in use and therefore need to be more flexible, today it is also used for many scientific works. Whether you want to print a term paper, a bachelor, master's or doctoral thesis, a softcover binding can open up many creative possibilities. 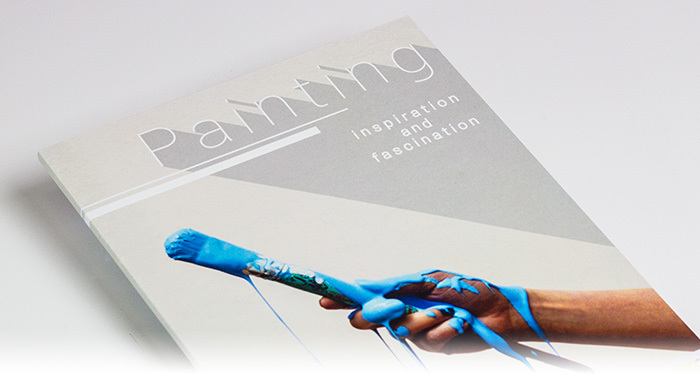 Softcover bindings are especially suited to brochures and booklets of all kinds. Hardcover bindings are preferable if you want an especially durable and stable book. If you want to present the results of your thesis in an elegant look, then hardcover bindings offer many options to provide you with a beautifully designed final product. Here you can either choose a stylish foil-stamped lettering (in gold, silver or other colours) on a leather or linen cover, or alternatively your individually designed printed cover. Paperback: Perfect softcover binding, which we use to create paperbacks, is a particularly inexpensive and good-looking softcover binding, which allows you to make documents with up to 350 pages. At our online copy shop a variety of coloured cardboards are available. You also have the possibility to have an individual design printed on the cover. Your document will be printed and then glued into the cardboard cover. For this we use newest technology and high quality materials, so that the result remains stable and durable even after frequent use. 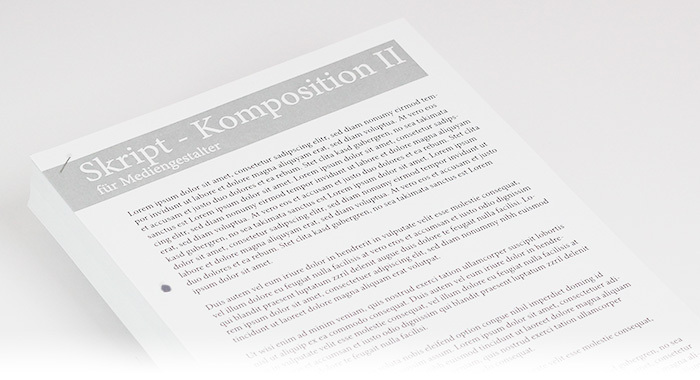 The A4 and A5 paper formats are available, but you can also specify your own dimensions. An online cover designer is available for all formats. When you bind a dissertation or thesis, create a brochure or want to print a book, then perfect softcover binding is a convenient and high-quality choice. 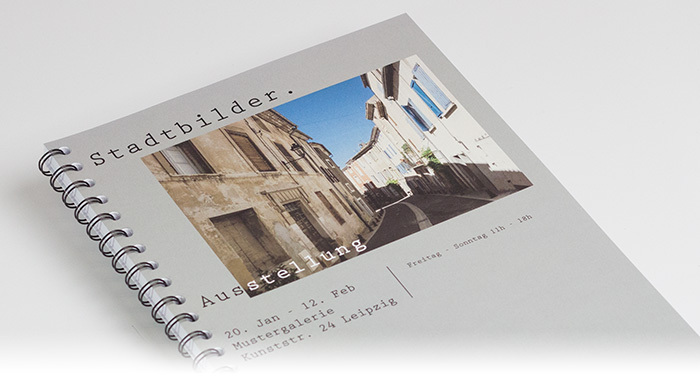 Saddle-Stitched Brochure: Saddle-stitched brochures are suitable for music books, pamphlets and other documents under 80 pages long. Again, the cover design is entirely up to you and you can choose from many types of paper. The pages of your document will be stapled together with wire staples at the fold line, so the resulting booklet can be completely opened and folded without breaking the spine. You can choose between A4 and A5 paper format. Plastic Ring Binding: The plastic ring binding or plastic spiral binding is particularly low-priced. The individual print pages are held together by a set of plastic rings; cover and spine can be designed on different cardboards. A4, A5 and A6 formats are available. The plastic spiral can be opened again, so that it is also suitable for the organization of work materials or seminar documents. If you wish to print a thesis or bind a presentation as a book, then the plastic spiral binding is a practical, affordable choice. Wire Ring Binding: Wire-O spiral binding is ideal if you want to print documents such as transcripts, training documents or lecture notes as a flexible book. The individual pages are held together with a metal wire ring. Different colours, cardboards and formats are available. Wall Calendars: Our wall calendars can be ordered in formats A4 and A3. Give free reign to your imagination and use your own images and design for a product or gift with a very personal touch. Strip Binding: Strip Binding is particularly suitable if you want to print long documents such as books, dissertations or business documents. Up to 440 sheets of paper can be bound together with this stable binding system. A comb-like binding strip holds the sheets together while the spine will be reinforced with a fabric tape. Here at our online copy shop numerous cardboards and colours are available. An individual printed cover is also possible. Hardcover Binding: If you want to print an PDF file as a book, then our classic hardcover binding is always a good option. The perfect binding hardcover is characterized by high stability and a quality appearance that comes as an advantage if you want to print a thesis or dissertation. This type of binding is often found in university libraries and can be designed in many ways. 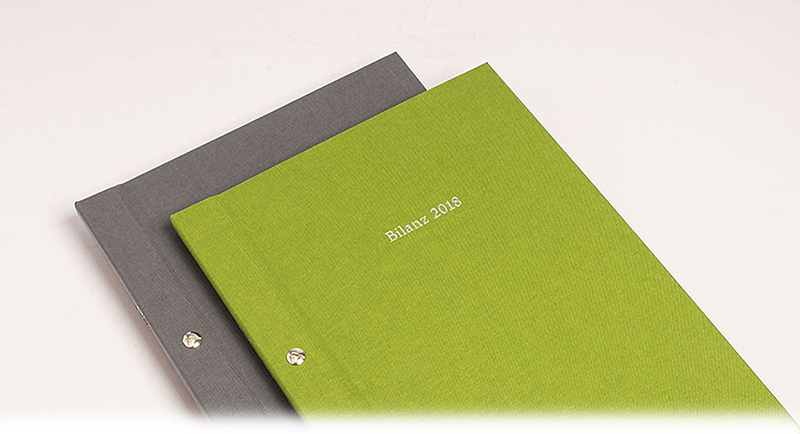 Choose between book leather or linen fabric in many colours, you can create foil-stamped lettering or your own printed cover design - for instance by using our online cover design tool. At our online copy shop there are many possibilities. If you want to make a good impression, then the hardcover binding is perfect for you. 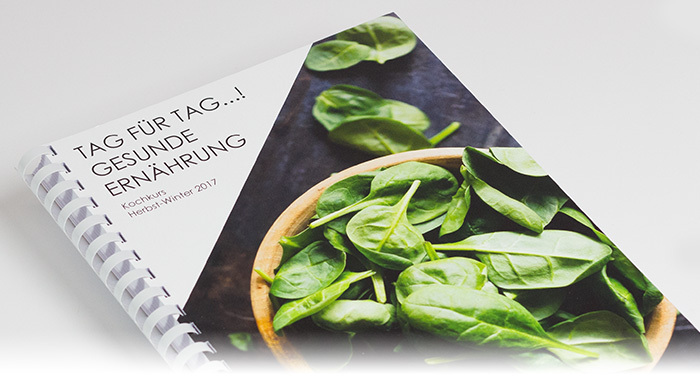 Hand-made Books: Individual and high-quality - if you want to print a book, then this option is the first choice at our online copy shop. Experience the results of traditional bookbinding by a professional and choose between numerous design possibilities. 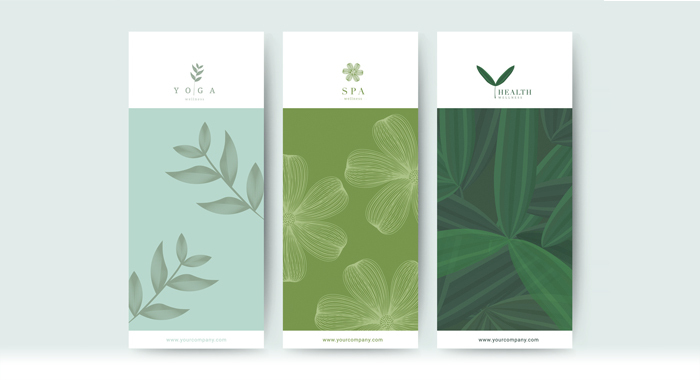 Select your paper format, foil stamping or printed cover, book leather or linen covers in different colours, opt for a sewn book block or add book corners and one or two bookmark ribbons. Also, a CD or DVD can be attached and configured. You want us to print an individual and especially high-quality book? Then our hand-made book is the right choice for you! Hardcover Ring Binding: Like with the softcover ring binding the pages are held together by a set of solid metal wire rings. But in contrast to it, here the cover is made of solid book leather or real linen cloth and can be decorated with foil-stamped lettering or an individual printed cover. Whether you want to print a dissertation, master's or bachelor's thesis or something else like a cooking book, the hardcover ring book is a flexible and durable solution. Hardcover Springback Binding: Cheap, easy-to-use and of high quality - the hardcover springback binding is suitable for all documents with 15 to 195 pages. Whether you want to bind or print a long master's thesis or bachelor thesis: This special hardcover book binding bestows an elegant look on every document. The springback binders are available in black or blue. Loose Leaf Printing: Here we offer a variety of options to print documents wihtout binding them. However, your papers can be held together by corner stapling, prong fasteners or filing strips. We will also gladly print your flyers, cards, folded cards, greeting cards and business cards. Posters & CAD Plots: We print posters in A2, A1, A0 or your own measurements on matt or glossy paper. 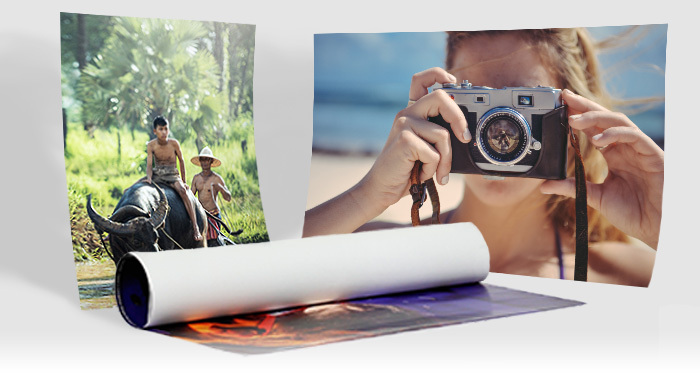 Whether photo posters or advertisement posters: We deliver a brilliant result. Our CAD plot service for line drawings is perfect for architects, engineers and other customers who need plans and technical drawings. 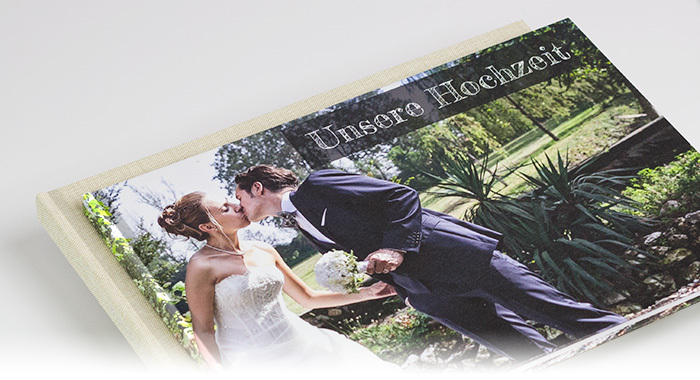 Special Custom-made Products: You want to design your own photo album or have different exciting printing ideas that are not covered by our product palette? Then please contact us, we migth be able to realize your ideas together with you. If you want to print a thesis or dissertation, you will need to submit your document as a PDF file. You can upload it in the card during your Order. Check the format requirements of your institution and make sure that there has been no transmission errors during file upload. If you want us to print a book with a cover design you made by yourself, we will also need your cover design as a PDF file. For most products at our online store, our online cover designer will also be available. For further information please have a look at our help section. Top Quality: If you have invested a lot of time in your work, then you might want the result to reflect this in design. We therefore guarantee professional printing in the highest possible quality with our online printing service. Versatile: We offer numerous types of bindings so you can customize your work to your exact needs. 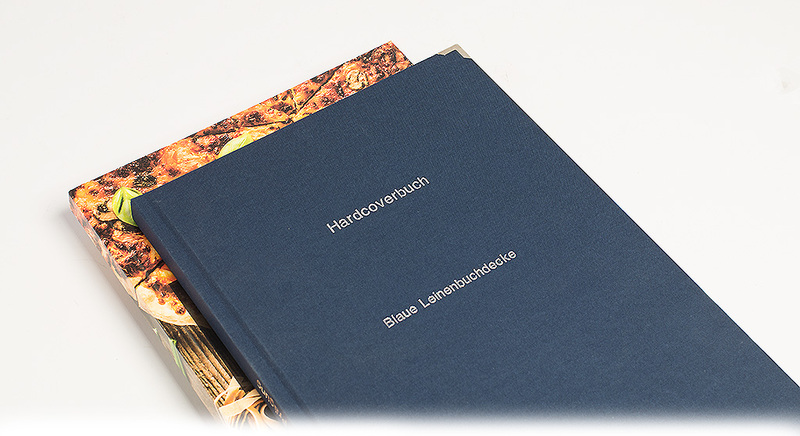 From individual printed covers to special colours and textures: If you want us to bind your thesis or print another document as a book, then you have all the opportunities you might wish for at our online copy shop. Quick: If the deadline is approaching, time is of essence to the printing and binding process. That's why we provide a fast printing service for you. Order your work Monday to Friday before 14:00 and we will usually ship the finished product on the same day. The estimated shipping date will be displayed during the calculation and ordering process. No matter what kind of job it is: you get the result as quickly as possible. Secure: Your data is safe with us. You can upload your print data as PDF files directly to our server. In addition, all our pages are encrypted with SSL. Neither print data nor contact data will be handes over to third parties. Thus, we offer the highest possible protection for your print data and your privacy. Personal: As an online copy shop we are always responsive to our customers. We advise you in detail about your options as well as current trends. When you print your dissertation or thesis and you want to make a good impression, we will help you. Fair: Whether you want to bind your bachelor's thesis or print a poster - our prices are always calculated fairly and can be seen live with our online price calculator. We guarantee you: No hidden costs, but full transparency. Whether you print booklets or books: With increasing print runs the prices per copy will get even lower. Eco-Friendly: A responsible approach to environmental issues is important to us. Therefore, we focus on green electricity in our outlets and solar power as well as certified European paper. On request we will use the particularly environment-friendly wax colour printing system. We also provide a CO2-neutral shipping with environmentally friendly vehicles and an environmentally friendly packaging. Our online copy shop is also involved with several social organizations. When you bind a book with us or print your dissertation or thesis, then you can do so with a clear conscience. More about our commitment to environmental and social issues. You have further questions regarding our online copy shop? Please do contact us. We are here to help you and inform you in detail about your options and our services.